Every state besides Alaska and Hawaii has some sort of poisonous snake. Whatever your dog does when it approaches a rattlesnake could end up being deadly. According to PetMD, “If your dog happens to be bitten by a poisonous snake the odds are in favor of a complete recovery. The degree of damage inflicted by a venomous snake is determined by a wide variety of variables. The age and species of snake, the intensity and depth of the fang penetration, the amount of venom injected, the location of the bite, and the size of the dog are just a few of the variables.” Another variable is how soon you get the dog medical treatment. How do you prevent a snake bite? 1. Keep your dog on a leash while hiking or camping so that you have control. 2. Stay on the trails where you can see what is ahead. Many snakes will be under rocks, logs or bushes where your dog will be sniffing. 3. Don’t leave your dog unattended where there is a potential for snakes. 4. 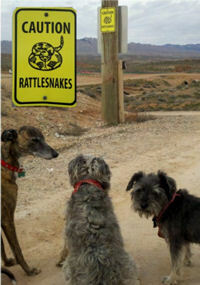 Take your dog to a rattlesnake aversion class. The trainer puts a mild shock collar on your dog and introduces them to different snakes by sight, smell and sound. The trainer gives your dog a mild shock if your dog is “curious”. The hope is that your dog will associate the snake with the shock and stay away from them. 1. Try to identify the snake and take note if there is a rattle. 2. Keep the dog as still as possible so that the venom does not spread. 4. GET TO THE NEAREST VET ASAP**!! Many vets do not carry the antivenin needed therefore, if you are going camping, hiking or live in a rural area—check to see what is the nearest vet in the area that carries it. Although, any vet is better than none at all as they will treat the bite. Snake bites are a serious concern and should not be taken lightly. The treatment is not only extremely expensive but it is not too much fun for Fido! Many dogs are lost each year because of snake bites so PLEASE be extremely careful and take the proper precautions to prevent Fido from being bit. Dawn Celapino is owner of Leash Your Fitness, a fitness company in San Diego where your dog is your workout partner. 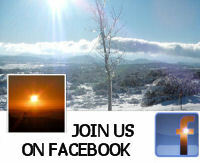 Their events include hiking, camping, kayaking, surfing and other outdoor activities.